Expanded reissue with 3 new piano tracks recorded in 2018. New edition of Steven Brown’s classic solo piano suite, including the bonus tracks from ’The Ghost Sonata’  featuring his Tuxedomoon bandmate Blaine L. Reininger, and now three tracks from ‘Belly Of The Whale’ . 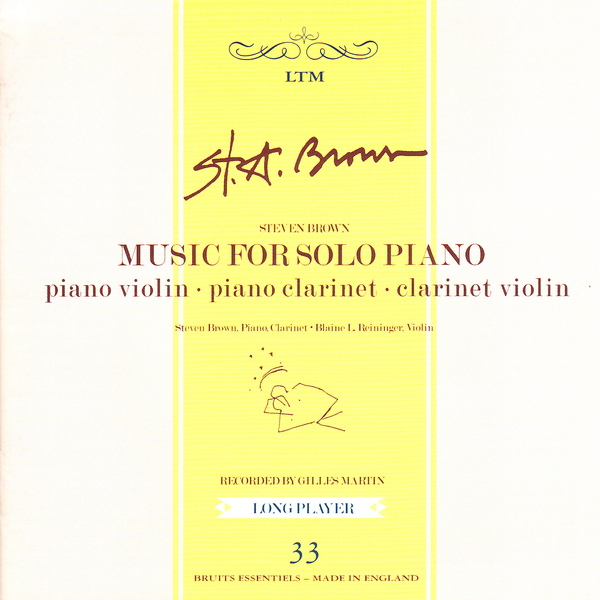 First issued in 1983, ‘Music For Solo Piano’ found Steven Brown stripping back from Tuxedomoon’s no wave cabaret style to a more intimate, personalised expression of solo piano and clarinet melancholia in refined, chamber-like settings with hauntingly unique results that have lost none of their timeless charm. The additional six parts from ‘The Ghost Sonata’ follow suit, accompanied by Blaine L. Reininger for a majestic and melodramatic “opera without words”, before ‘Belly Of The Whale’ brings us up to date with Steven Brown’s contemporary practice, some 30 odd years later, focussed on him and the keys in a jazzier modern classical fashion. Expanded CD, includes bonus tracks.